﻿Bruce Goodman's "Toad goes for a drive"
Toad and Mole were sitting in Toad’s car waiting for Ratty and Badger. They were all to go for a Sunday drive. Ratty and Badger were extremely late. “Let’s go for a quick spin around the block while we wait,” suggested Toad. “I’ll wait here in front of Toad Hall, and you go,” suggested Mole. “They might turn up while we’re gone.” He didn’t like Toad’s driving one bit. 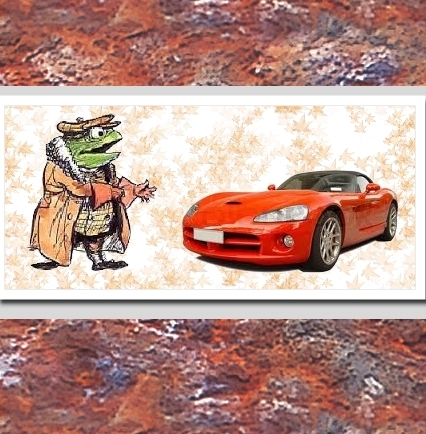 Off Toad went, roaring in his new, bright red sports car. VROOOOOM! A few minutes later he reappeared, braking to a screeching halt.